During an immune response a small number of rare Ag-specific clones proliferate extensively and decline, leaving a residual population for long-term memory. TCR transgenic (tg) CD4 T cells have been used widely to study the primary and memory response in vivo. We show here that naive TCR tg CD4 T cells from the DO11.10 strain transferred into wild type (wt) BALB/c recipients and not stimulated declined rapidly at the same rate as those primed in vivo by Ag. In the same recipients wt CD4 T cells survived. There was no evidence of an inherent defect in the tg T cells, which survived well when returned to DO11.10 recipients. Surprisingly, wt CD4 T cells declined rapidly in the same DO11.10 hosts. By depleting wt recipients of NK cells or CD8+ cells, the speed of reduction was slowed by half; rapid destruction was prevented completely by combing the two treatments. In contrast, preimmunization accelerated the loss of tg T cells. The results suggested that tg CD4 T cells were actively rejected by both NK and CD8 T cell responses. We consider whether, despite extensive backcrossing, tg T cells may retain genetic material (minor histocompatibility Ags) flanking the construct that compromises their survival in wt recipients. The advent of TCR transgenic (tg)3mice provided investigators with a powerful tool to explore the behavior of single clones, normally too rare in wild-type (wt) mice to be identified. Jenkins’s group pioneered the idea that a cohort of tg CD4 T cells could be studied in vivo following transfer to wt hosts (1). TCR tg CD4 T cells from the DO11.10 strain, transferred and stimulated in vivo with Ag, proliferated extensively and then rapidly declined (2). The contraction after clonal expansion was profound. By 4–5 wk the number of tg CD4 T cells remaining was less than the number initially seeded (3). The demise of the tg CD4 T cells was not unique to the DO11.10 strain and has been a constant feature of other tg models including OT-II (4), SM1 (5), and possibly others (6, 7). Recently this loss was hypothesized to be part of a normal contraction process that evolved to select against the dominance of single clones in favor of an abundance of clones (5). It was suggested that each T cell needed to compete for a limited resource, namely a clone-specific survival signal delivered via the TCR (8, 9). It was envisaged that the variety of self-peptides presented on MHC class II (10) would engage specific TCRs and maintain the T cell’s survival (11, 12). In the present investigation, we examined the survival of tg CD4 T cells from the DO11.10 strain following transfer and found that naive, unstimulated, tg T cells disappeared as quickly as those that had been Ag primed did. In contrast, wt CD4 T cells in the same recipients declined slowly with a long half-life. We investigated the reasons for the rapid demise and discovered that the tg T cells were apparently destroyed by components of the innate and the adaptive immune response in wt recipients where there was no MHC difference. BALB/c mice were derived from three different sources: BALB/c-Ighb (M. K. Jenkins, University of Minnesota Medical School, Minneapolis, MN), BALB/cOlaHsd (Harlan-Olac), and BALB/cByJ (The Jackson Laboratory). DO11.10 mice on a BALB/cJ background (13) (University of Glasgow, Glasgow, Scotland) were bred and maintained under barrier conditions in the animal unit of the University of Manchester (Manchester, U.K.) or from the colony bred at the University of Oxford (Oxford, U.K.; supplied by Dr. C. Hetherington). Mice were used at 6–18 wk of age. All experiments were undertaken within the terms of an Animal (Scientific Procedures) Project License issued by the Home Office of the U.K.
Anti-clonotypic mAb KJ1-26 (13),which recognizes the OVA peptide-specific TCR, was produced from a hybridoma cell line and purified using ProSep affinity chromatography. KJ1-26 mAb was biotinylated with EZ-Link sulfo-NHS-biotin (Pierce) according to the manufacturer’s instructions. The following rat anti-mouse mAbs (clone in parentheses) were purchased from BD Pharmingen: CD4 and biotinylated CD4 (GK1.5), PE-CD4 (RM 4-5), CD19 (1D3), CD8 (53-6.7), B220 (RA3-6B2), CD49b/pan NK cell (DX5), and CD16/CD32 “Fc block”. Biotinylated Abs were detected with streptavidin-Tri-color (Metachem Diagnostics) or streptavidin-PE (Sigma-Aldrich). OVA (Grade V; Sigma-Aldrich) or OVA peptide 323–339 (OVA-pep) (synthesized by Sigma Genosys) was injected i.p. in soluble form or after alum precipitation (ap; ap-OVA and ap-OVA-pep, respectively) or after emulsification in CFA (CFA-OVA-pep). CFSE was purchased from Molecular Probes. For depleting NK cells in vivo, mice were injected i.v. with rabbit anti-mouse asialo GM1 polyclonal Ab (ASGM1) (Cedarlane). For depleting CD8α cells, a mixture of two synergistic mAbs, YTS 196.4 plus YTS 156.7 (a gift from Dr. S. Cobbold, University of Oxford, Oxford, U.K.) was injected i.p. at a combined dose of 1 mg/injection. Spleens and lymph nodes (LNs) were teased apart, filtered through nylon mesh to obtain a single cell suspension, depleted of RBC on Ficoll-Hypaque (Sigma-Aldrich), and stained with mAbs plus the addition of 1 μl of “Fc block” as previously described (3). Live lymphocytes were electronically gated by size and granularity (forward scatter/side scatter) and 1–50 × 104 cells were acquired for analysis on a FACSCalibur flow cytometer (BD Pharmingen) using Cell Quest-Pro software. DO11.10 and BALB/c CD4 T cells used for adoptive transfer were obtained from LNs combined (or not) with spleen, in which case RBC were lysed in Boyle’s medium (1 ml/spleen at 37° for 5 min). CD4 T cells were purified as previously described (14) by depleting the CD8 T cells and B cells. The resulting population was >95% CD4+ of which 70–80% were KJ1-26+. In one experiment, CD4 T cells from spleen and LNs were purified by depletion from DO11.10 and wt donors using SpinSep (StemCell Technologies). The procedure for labeling LN cells with CFSE (15) was slightly modified (3). CD4 T cells from the DO11.10 strain expressed a TCR for a peptide of OVA (OVA-pep) (13) and were identified by the clonotypic mAb KJ1-26 (16). Following transfer, tg CD4 T cells responded vigorously to Ag challenge, proliferated, reached maximum levels during the first 5–7 days, and then rapidly declined (1, 2, 3, 17). The DO11.10 transgene was extensively backcrossed onto the wt BALB/c strain and there was no evidence of tissue incompatibility (17). We compared the survival of naive tg T cells directly with purified CD4 T cells from wt BALB/c donors (both populations labeled with CFSE) following transfer into BALB/c recipients. The tg and wt donor cells were clearly identified by flow cytometry after injection (Fig. 1⇓A) and were monitored during the following 4 wk. The donor cells retained a naive phenotype (CD45RBhigh CD44low; data not shown) and did not divide. Analysis of the gated CFSE+ donor cells (Fig. 1⇓B) shows the loss of tg relative to wt CD4 T cells. 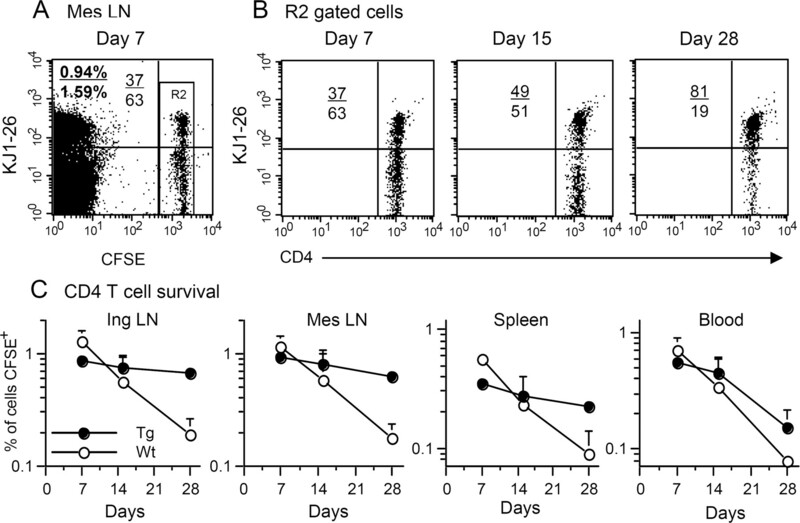 The decay curves for two independent experiments illustrates the exponential decline of tg CD4 T cells in the inguinal and mesenteric LNs (Fig. 1⇓C). The average t1/2 of tg T cells in these experiments was 3.2 days. In contrast, the wt T cells decayed slowly (Fig. 1⇓D) as expected. The rapid loss of tg T cells was not dose dependent. We and others have observed a similar disappearance following the transfer of >107 or <105 DO11.10 T cells (18, 19). Tg CD4 T cells decline rapidly following transfer to wt recipients. CD4 T cells were purified from LNs of tg DO11.10 (solid symbols) or wt BALB/c donors (open symbols) (experiment 1 (Exp1), BALB/cOlaHsd; experiment 2 (Exp2), BALB/c-Ighb), labeled with CFSE, mixed at a ratio of 2:1 (experiment 1) or 1:1 (experiment 2) (tg T cells:wt T cells) and 10 × 106 injected i.v. to BALB-Ighb (experiment 1) or BALB/cOlaHsd (experiment 2) recipients. 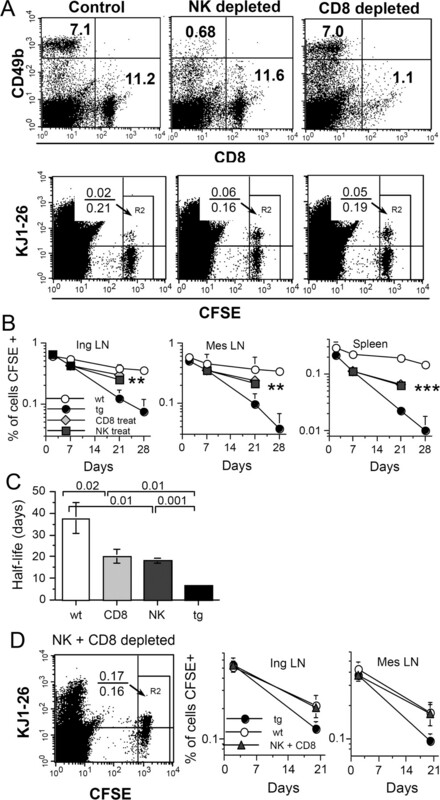 Mice were killed at intervals and LNs were removed, stained with KJ1-26 plus anti-CD4 mAbs, and analyzed by three-color flow cytometry for tg (KJ1-26+CD4+CFSE+) and wt (KJ1-26−CD4+CFSE+) T cells. A, A representative profile from experiment 2 shows the gate for CSFE+ donor cells (R1); the donor population as a percentage of all lymphocytes is shown in bold text (tg/wt). Numbers in plain text represent the percentage of the gated donor T cells (100%) that were tg/wt. B, The profiles of R1-gated donor cells from experiment 2 are representative of the changing proportion of the tg vs wt CD4 T cells with time. 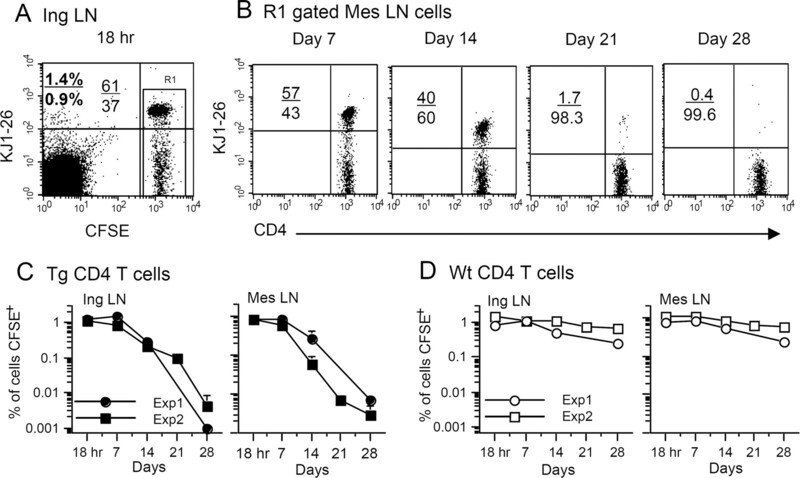 C and D, The survival patterns of the tg (C) and wt CD4 T cells (D) for experiments 1 (Exp1) and 2 (Exp2) are shown for the inguinal (Ing) and mesenteric (Mes) LNs. Each point represents the mean + range or SD of two or three recipients. We asked whether the loss was the result of an inherent defect linked to the transgene. Tg CD4 T cells were mixed with CD4 T cells from wt mice, labeled with CFSE, and injected back into DO11.10 recipients. By day 7, approximately one-third of the donor cells were identified as tg and two-thirds were wt (Fig. 2⇓A). The proportion of tg:wt T cells changed steadily (Fig. 2⇓B) so that by day 28, ∼80% of the remaining donor cells were tg T cells. In contrast with transfer to wt hosts, tg T cells now had a prolonged lifespan (t1/2: 32–53 days) (Fig. 2⇓C), consistent with that of naive syngeneic T cells. There was no evidence that the tg T cells were inherently defective. Surprisingly, the BALB/c wt T cells showed a rapid decline (t1/2 7.7 days) (Fig. 2⇓C), comparable with the loss of tg T cells in wt recipients. The results suggested there could be a subtle disparity between the DO11.10 and the BALB/c strains despite extensive backcrossing. Tg T cells transferred to DO1.10 recipients survive whereas wt CD4 T cells decline rapidly. A 1:1 mixture of tg and wt CD4 T cells (BALB/cOlaHsd) from LNs and spleen was labeled with CFSE and a total of 15 × 106 injected i.v. to DO11.10 hosts. A, A representative profile from DO11.10 recipients shows the gate for CSFE+ donor cells (R2) and the donor population as a percentage of all lymphocytes in bold text (tg/wt). Numbers in plain text represent the percent of the gated donor T cells (100%) that were tg/wt. B, The profiles of R2-gated donor cells are representative of the changing proportion of the tg vs wt CD4 T cells with time. C, The survival of the tg (solid symbols) and wt CD4 T cells (open symbols) was monitored in various tissues. Each point represents the mean + SD of four recipients. Ing, Inguinal; Mes, mesenteric. We considered whether mice from the BALB/c strain available in the U.K. (U.K.-BALB) that have been bred separately for over 40 years (information from Harlan-Olac), were different from The Jackson Laboratory mice (Jax-BALB) in the United States into which the DO11.10 transgene had been bred. CD4 T cells from DO11.10 donors were mixed with CD4 T cells from U.K.-BALB donors, labeled with CFSE, and injected into Jax-BALB recipients. Similar to the loss shown in Fig. 1⇑, the tg T cells declined just as rapidly in the Jax-BALB recipients. Wt U.K.-BALB CD4 T cells remained elevated in Jax-BALB hosts (Fig. 3⇓A), consistent with full compatibility. As a further test, a single population of CFSE-labeled tg CD4 T cells was transferred to U.K.-BALB or Jax-BALB mice. 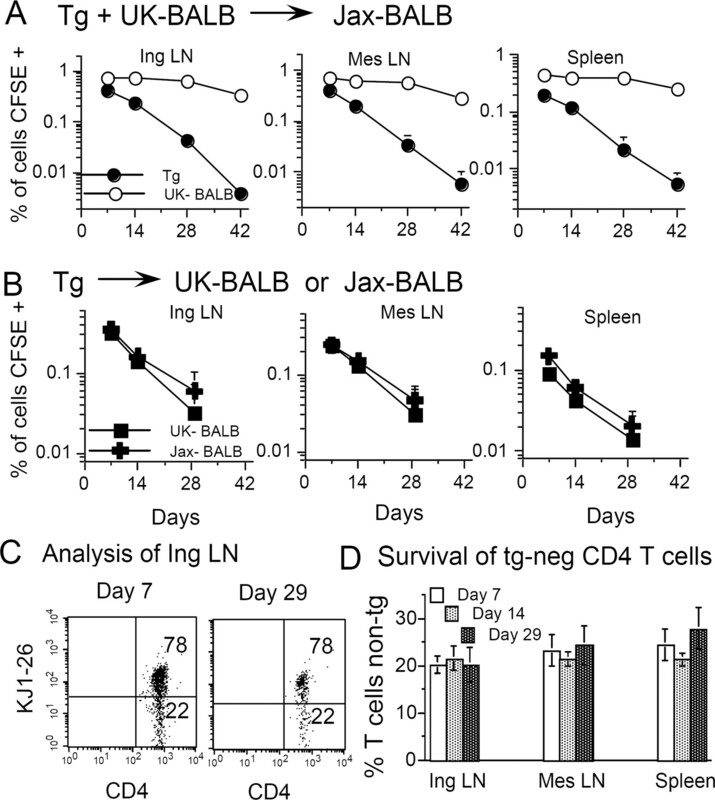 The tg T cells disappeared from lymphoid tissues at almost exactly the same rate in U.K.-BALB and Jax-BALB strains (Fig. 3⇓B). There was no evidence of histoincompatibility between the two BALB/c substrains with respect to the transferred donor cells. We also asked whether the rapid decline of tg T cells was related to the expression of the clonotypic TCR. Lymphocytes purified from DO11.10 donors included CD4 T cells that did not stain with mAb KJ1-26. The CFSE+KJ1-26− population that does not express the full transgenic αβTCR was also analyzed (Fig. 3⇓C, tg-negative). This enabled us to determine whether there was a different survival pattern between the tg-positive and tg-neg CD4 T cells. The proportion of tg:tg-negative T cells remained constant throughout (Fig. 3⇓D), showing that both populations were eliminated at the same rate. Hence, the loss of tg T cells was not solely related to the expression of the clonotypic αβTCR. Nevertheless, the tg-negative T cells would still express the transgenic Vβ8 chain (20). Survival of tg CD4 T cells is not influenced by the origin of the BALB/c recipients. A, CD4 T cells, purified from DO11.10 or BALB/cOlaHsd (U.K.-BALB) donors, were mixed 1:1, labeled with CFSE, and a total of 10 × 106 was injected i.v. into BALB/cByJ (Jax-BALB) recipients that were killed on days 7, 14, 28, and 42 and analyzed for the presence of tg T cells (•) and wt U.K.-BALB T cells (○). Each point represents the mean + SD of three or four recipients. B, Tg CD4 T cells were labeled with CFSE and 4 × 106 were injected i.v. into U.K.-BALB (▪) or Jax-BALB recipients (✚) and killed on days 7, 14, and 29 for flow cytometric analysis. Each point represents the mean + SD of three or four recipients. C, Representative profiles of donor T cells gated as in Fig. 1⇑ showing the percentage of KJ1-26+ (tg) and KJ1-26 negative CD4 T cells on day 7 and 29 after transfer. D, Both tg and tg-negative (tg-neg) CD4 T cells decline at the same rate. Values are means ± SD of three or four recipients representing the percentage of DO11.10 donor cells that were tg-negative. Ing, Inguinal; Mes, mesenteric. To determine whether Ag stimulation altered the survival pattern, BALB/c recipients containing tg T cells were primed by i.p. injection of ap-OVA-pep or CFA-OVA-pep, Th2 and Th1 cytokine-inducing adjuvants, respectively (19, 21). Following Ag challenge, tg T cells proliferated extensively, expressed the phenotype of a primed population (CD45RBlow CD44highCD62Llow) (3). and declined sharply irrespective of the adjuvant used. The loss was recorded as a percentage (Fig. 4⇓A) or an absolute number of tg T cells (Fig. 4⇓, B and C). By days 28–35, tg T cells were barely detectable. In comparison, the same cohort of tg T cells transferred without OVA challenge (Fig. 4⇓, No Ag), did not divide and declined at a nearly identical rate (t1/2, 3.0–3.8 days) despite the contrasting CD45RBhighCD44lowCD62Lhigh naive phenotype (3, 22, 23). A rapid loss of tg T cells was also observed using tg T cells obtained from mice where the transgene had been bred onto a RAG−/− background (SCID.DO11.10) (14). Tg CD4 T cells transferred to BALB/c-Ighb recipients and primed in vivo with specific Ag (OVA-pep) decline at the same rate as unstimulated naive tg T cells. Recipients were injected i.v. with 5 × 106 tg T cells, challenged i.p. 1 day later with 100 μg of ap-OVA-pep (•) (A and B) or 100 μg of CFA-OVA-pep (✚) (C) or received no Ag (○, ✙). At intervals the mesenteric (Mes) LN (top row) and inguinal (Ing) LN (bottom row) were removed, stained with KJ1-26 (KJ+) plus anti-CD4 mAbs and analyzed by flow cytometry. A, Decline of tg T cells as a percentage of the total population. B and C, The decline as a total number of tg T cells. Results from two (A and B) or four (C) experiments were pooled. Each point represents the mean + SD of 4–6 recipients except ap-OVA-pep (day 35, n = 7) and CFA-OVA-pep (“No Ag,” 18 h, day 3), n = 2. The hatched area indicates the level of background staining obtained from BALB/c-Ighb mice receiving no tg T cells (Bkg, n = 4). The relentless loss of the tg T cells bore the hallmarks of an ongoing rejection process. The only obvious allogeneic target remaining after extensive backcrossing would be the product of the transgene or the flanking regions adjacent to the construct. Allogeneic lymphocytes, in contrast to organ allografts, may be destroyed by NK cells (24) of the innate immune system as well as by the adaptive response. Hence, recipients were treated with anti-ASGM1, a reagent that kills NK cells in vivo (25), or with anti-CD8 to deplete CD8α-bearing cells. By transferring a mixture of tg T cells and wt CD4 T cells, we controlled for any effect (positive or negative) the treatment might have on CD4 T cells in general. Treatment was delayed until day 7 in an attempt to halt further decline of the tg T cells that might already be underway. ASGM1 treatment depleted the NK population, as measured by CD49b (Fig. 5⇓A, top row), and unexpectedly curtailed the elimination of the tg T cells (tg t1/2: 7.0 days; ASGM1 t1/2: 18.1 days) but did not prevent the killing completely (wt t1/2: 37.8 days) (Fig. 5⇓, B and C). Curiously, depleting recipients of CD8+ cells (Fig. 5⇓A, top row) also prevented the rapid loss of tg T cells just as effectively (CD8: t1/2: 20.2 days) (Fig. 5⇓, B and C). Neither treatment induced homeostatic proliferation as judged by CFSE levels that remained undiluted in the labeled population (Fig. 5⇓A, bottom row). Perhaps both ASGM1 and anti-CD8 were abolishing the same effector population. However, there was no evidence of double positive CD49b+CD8+ cells in the spleen (Fig. 5⇓A) or in the liver (data not shown). To determine whether a single or two independent effector mechanisms were operating, recipients were injected with tg and wt CFSE-labeled CD4 T cells and treated with both ASGM1 and anti-CD8 starting on day 2. The treatments were additive did not induce homeostatic proliferation and completely ablated the selective loss of tg T cells (Fig. 5⇓D), suggesting that in the absence of one effector population the other would continue to destroy the tg T cells, albeit at a reduced rate. Depleting recipients of NK cells or CD8+ cells significantly reduces the loss of tg CD4 T cells. A 1:1 mixture of tg and wt (BALB/cOlaHsd) CD4 T cells (total 6 × 106 cells) labeled with CFSE was injected into BALB/cOlaHsd recipients. Seven and 11 days later, groups of recipients were injected i.v. with normal rabbit serum or i.v. with ASGM1 (100 μg on day 7; 75 μg on day 11) or i.p. with depleting anti-CD8 mAbs (1 mg on days 7 and 10). A, Representative profiles are shown for spleens of normal rabbit serum- (Control), ASGM1- (NK depleted), or anti-CD8-treated (CD8 depleted) recipients 21 days after transfer and stained for CD49b (pan NK cell) and CD8 (top row) or KJ1-26 and CFSE (bottom row). Numbers in the top row represent the percentage positive in the quadrant. Profiles in the bottom row show the gate for CFSE+ donor cells (R2), and the numbers are percentages of donor cells among all lymphocytes that were tg/wt (KJ1-26+/KJ1-26−). B, Donor cell decay curves of tg (•) and wt CD4 T cells (○) (gated on CSFE+ cells) in the tissues indicated: normal rabbit serum (circles), ASGM1 (squares), and anti-CD8 injected (diamonds) recipients. Each point represents the mean + SD of four recipients. Differences between means were assessed using Student’s t test: ∗∗, p < 0.01; ∗∗∗, p < 0.001; NK treated (NK treat) and CD8 treated (CD8 treat) vs tg at day 21. C, Mean t1/2 ± SD, n = 3 of wt and tg CD4 T cells in the different groups. Bars above the histograms and p values indicate the level of significance. D, Combined ASGM1 and anti-CD8 treatment prevents the destruction of tg T cells. A mixed population (4:3) of CFSE-labeled tg (•) and wt (BALB/cOlaHsd) (○) CD4 T cells (total 7 × 106 cells) was injected into BALB/cOlaHsd recipients. Two days later, recipients were killed for analysis or injected with normal rabbit serum (control) or treated with both ASGM1 (100 μg on day 2; 50 μg on day 11) and anti-CD8 (1 mg on days 2 and 10) (▴). Recipients were killed for analysis on day 20. A representative profile (left) is shown for the mesenteric (Mes) LNs (details same as described above). The loss of tg and wt donor T cells is shown for inguinal (Ing) and mesenteric LNs (right). Only the wt T cells from the ASGM1 plus CD8-treated group (○) are shown for clarity; wt T cells in the NRS group were nearly identical. Each point represents the mean ± SD of 4–5 recipients/group. If the adaptive immune response was actively involved, priming recipients with tg T cells should accelerate the rejection process. An earlier report found no evidence of an immunization effect (5). However, in that study preinjected recipients were only examined 6 days after the second transfer, too short an interval to detect an accelerated decline. Hence, a group of recipients was preinjected with unlabeled tg T cells followed 14 days later with CFSE-labeled tg T cells. Prior immunization accelerated the destruction of the CFSE+ donor population (Fig. 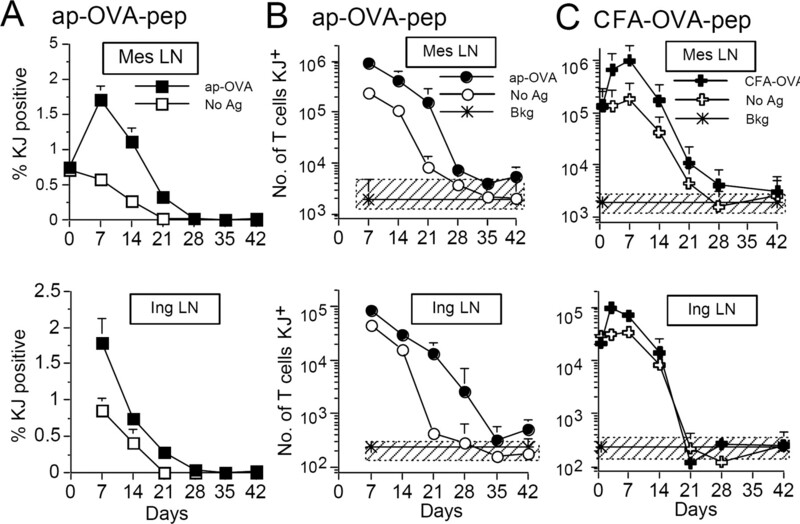 6⇓A), significantly reducing the half-life from 8.9 days in the control to 4.9 days in the immunized mice (Fig. 6⇓B). The loss of tg T cells is accelerated in recipients previously injected with tg T cells. A, Un-injected BALB/cOlaHsd recipients (•) or BALB/cOlaHsd recipients preinjected (Pre-inj) with unlabeled tg T cells (2.5 × 106) (□) 14 days earlier received 3 × 106 CFSE-labeled tg CD4 T cells. Tissues were analyzed on days 2, 7, and 21. Values represent means + SD of four recipients per group. Ing, Inguinal; Mes, mesenteric. B, Histograms compare the mean t1/2 of tg vs preinjected groups. Values are means ± SD, n = 3. ∗∗, p < 0.01. Many transgenic strains of mice have been generated to explore the underlying mechanisms of the immune response. Extensive backcrossing of these transgenes into inbred strains genetically different from the embryonic stem cell ensured histocompatibility at the MHC loci and encouraged the adoptive transfer to recipients of the same inbred stain. Transferring DO11.10 tg T cells enabled investigators to study Ag-specific T cells in vivo in a near-normal physiological environment (1), avoiding the uncertainties linked with stimulating lymphocytes in vitro. In most respects, DO11.10 T cells appeared to function like wt CD4 T cells following transfer, at least in the initial stages of the immune response. However, the transferred tg T cells declined rapidly following Ag-driven proliferation, an observation reported even in the earliest publications (1, 2). Our curiosity was aroused after observing that the speed with which the donor tg T cells disappeared was the same regardless of whether they were Ag primed and rapidly dividing or remained quiescent and phenotypically naive. In retrospect, tg T cells do not appear to be ideal candidates to study long-term CD4 T cell memory. The demise after transfer was not confined to the DO11.10 strain and was observed in other TCR CD4 T cell tg models (4, 5, 7). Although TCR tg CD8 T cells have also been used widely, it is not clear whether a similar cell loss occurred in this model (26). There are substantial differences between CD4 and CD8 T cells in their ability to survive (27, 28). CD8 T cells proliferate more extensively (29) and produce exceptionally large numbers of clonal progeny that, unlike CD4 T cells (9, 30), may expand homeostatically under the influence of IL-15 (31, 32). These properties could easily mask a concurrent destruction of tg CD8 T cells. A direct comparison between the lifespan of naive tg and wt polyclonal CD8 T cells in the same recipient would be informative. The present study showed that, in direct comparison with wt CD4 T cells, tg T cells survived poorly in wt recipients. Conversely, the same mixture transferred to DO11.10 hosts revealed long-term survival of tg T cells and, unexpectedly, the rapid decline of wt T cells, suggesting an incompatibility between the tg and wt strains. By preimmunizing wt hosts, the loss of tg T cells was accelerated modestly but significantly (p < 0.01), consistent with the presence of a minor histocompatibility Ag disparity. Furthermore, the rapid demise was inhibited by depleting recipients of either NK cells or CD8α+ cells. Combining both ASGM1 and anti-CD8 treatments prevented the selective loss of tg T cells entirely. Evidence that NK cells were active against tg T cells was previously reported by others under different circumstances. Tg (Marilyn) CD4 T cells were transferred into syngeneic, T cell-deficient, RAG−/− recipients (33), a model that permitted extensive homeostatic T cell proliferation. Using NK cell-deficient RAG−/−γc−/− recipients, the tg T cells proliferated even faster, suggesting two possible explanations (33): 1) that the tg T cells, derived using strain 129 embryonic stem cells, may have retained genetic material recognized by NK cells; or 2) that the lack of competing NK cells in γc−/− recipients released additional resources, e.g., IL-7 and IL-15 cytokines, that enhanced homeostatic proliferation. In a recent study, Ag-primed “memory” tg CD4 T cells were injected into lymphopenic recipients treated with anti-NK plus anti-CD8 Ab (30). Again, more of the tg memory T cells proliferated in the double-depleted recipients. The enhanced cell division was attributed to an increase in the availability of IL-7 and IL-15 resulting from the removal of the competing NK and CD8 T cells. We believe our data are more compatible with a direct killing mechanism. The DO11.10 tg T cells were transferred into wt mice whose lymphoid compartments were full and in equilibrium. Monitoring of donor T cell survival commenced 7 days after transfer, by which time the lymphoid system would have returned to a steady state. The naive tg T cells did not divide even in recipients depleted of NK and CD8 T cells and declined in absolute numbers. It could be argued that the sudden large dose of tg T cells exhausted a limited supply of survival-inducing cytokines. This is unlikely; if the T cells were dying by neglect, the wt T cells would be equally affected because they would be competing for the same resources. The results showed clearly that the loss of transferred CD4 T cells was selective: tg T cells disappeared and wt T cells were spared. Had the DO11.10 transgene not been extensively backcrossed into the wt strain, the loss of the tg T cells would have been attributed without debate to minor histocompatibility Ag differences. The investigations of Hatyae et al. (5) showed that very small, but not large, numbers of TCR tg T cells were tolerated in adoptive recipients. It was argued that a mechanism, based on self-peptide MHC class II-mediated survival signals, has evolved to control the size of a monoclonal T cell population to prevent skewing of the repertoire. In this regard, the transfer of tg and wt CD4 T cells back into DO11.10 hosts (Fig. 2⇑) was very informative. These results appeared to be at odds with the concept of clonal abundance. The data were incompatible with the idea that individual T cells competed for limited self-peptide-MHC class II survival signals (9, 12). Tg T cells injected back into DO11.10 mice would be at a distinct disadvantage, competing against vast numbers of host-derived monoclonal T cells for the same resources. Conversely, a polyclonal population of wt T cells would be at an advantage; the variety of self-MHC complexes needed to maintain a multiclonal T cell population should be as abundant in tg hosts as they would be in wt hosts and thus should have prolonged wt T cell survival, which they did not. Historically the idea that the clonal repertoire is regulated was proposed over three decades ago and forms the basis of Jerne’s anti-idiotype network theory (34). Perhaps the anti-idiotype response would not, as Jerne envisaged, be mediated by Ab but instead be regulated by NK and CD8 T cells. To satisfy this hypothesis, presumably endogenous products of the TCR would need to be presented on MHC class I to be recognized. At present, this scenario remains highly speculative. The transfer of tg T cells into wt recipients underpins a significant body of experimental work and was founded on the presumption that donor and host were fully compatible. Is there evidence to support the idea that there were minor histocompatibility Ag differences between the congenic DO11.10 and the inbred BALB/c strain? It is important to consider the development of the DO11.10 strain and the insertion site of the transgene, especially the “differential” segment of chromosome surrounding the gene, i.e., the gene and the flanking regions. Developing a congenic strain by backcrossing selects for MHC to prevent rejection, but the designated gene will be transferred along with the donor-derived differential segment. In general, the length of the differential segment is reduced in a predictable way, primarily by recombination, and is directly related to the number of backcrosses (35). However, by mapping the length of differential segments in “congenic resistant” strains (strains selectively bred to differ from backgrounds by a single minor histocompatibility Ag), the general rule no longer held (36). The study showed there was no correlation between differential segment length and number of backcrosses. Apparently, factors other than recombination were affecting length. Minor histocompatibility Ags represent peptides presented on MHC class I and class II after processing and are nearly always based on a single amino acid substitution caused by a single nucleotide polymorphism (SNP) (37, 38). The minor histocompatibility Ags are generated by nonsynonymous (NS) nucleotide substitutions that alter the amino acid and thus the peptide. Could there be minor histocompatibility Ags that remained in the flanking regions despite backcrossing? It is known that NS SNPs are not distributed uniformly along the chromosome but rather are usually clustered (39). Mapping differential chromosome segments also showed that a large number of NS SNPs were clustered very close to the minor histocompatibility Ag gene (36). It has been proposed that clustering may be indicative of a selective advantage related to increased fitness and reproduction (40); hence, a shortening of the differential segment by recombination could eliminate minor genes ultimately important for survival of the embryo. Under these pressures, only those offspring retaining the minor histocompatibility Ags would be selected. The same rules should operate in the selection of congenic strains carrying a transgene. There are many examples in which linked genetic material has influenced the phenotype of the tg strain (41, 42). With regard to the DO11.10 strain, the α- and β-chain-rearranged DNA constructs were comicroinjected into (C57BL6 × C3H)F1 female × BALB/c male embryos and founder mice were bred back to BALB/c (K. Murphy, personal communication). Further evidence indicated that the integration site was on chromosome 18. In view of the present evidence, it seems likely that the DO11.10 transgene integrated into a chromosome 18 of either C57BL6 or C3H origin; it may now be possible to verify this suggestion experimentally (43). In conclusion, the present study illustrates a precautionary principle that applies to all tg (and knockout) strains derived by backcrossing into an inbred strain different from the founder. Transgenes inserted into embryos carrying the same genetic background as the selected strain would avoid the problems of flanking genes (42); in the past, this was not usually possible. The unwelcome retention of minor histocompatibility Ags severely compromises the survival of transferred tg cells and significantly restricts interpretation of the results. We thank Jürgen Westermann and David Gray for helpful advice. ↵1 This work was supported by funds from the Dunhill Medical Trust and the University of Manchester. ↵3 Abbreviations used in this paper: tg, transgenic; wt, wild type; ap, alum precipitation; ASGM1, anti-asialo GM1; BALB/cOlaHsd, BALB/c from Harlan-Olac; Jax-BALB, BALB/c strain from The Jackson Laboratory; LN, lymph node; NS, nonsynonymous; OVA-pep, OVA peptide 323–339; SNP, single nucleotide polymorphism; U.K.-BALB, BALB/c strain available in the United Kingdom. Kearney, E. R., K. A. Pape, D. Y. Loh, M. K. Jenkins. 1994. Visualization of peptide-specific T cell immunity and peripheral tolerance induction in vivo. Immunity 1: 327-339. Yang, C. P., S. M. Sparshott, D. Duffy, P. Garside, E. B. Bell. 2006. The phenotype and survival of antigen-stimulated transgenic CD4 T cells in vivo: the influence of persisting antigen. Int. Immunol. 18: 515-523. Hataye, J., J. J. Moon, A. Khoruts, C. Reilly, M. K. Jenkins. 2006. Naive and memory CD4+ T cell survival controlled by clonal abundance. Science 312: 114-116. Tanchot, C., A. Le Campion, B. Martin, S. Leaument, N. Dautigny, B. Lucas. 2002. Conversion of naive T cells to a memory-like phenotype in lymphopenic hosts is not related to a homeostatic mechanism that fills the peripheral naive T cell pool. J. Immunol. 168: 5042-5046. Labrecque, N., L. S. Whitfield, R. Obst, C. Waltzinger, C. Benoist, D. Mathis. 2001. How much TCR does a T cell need?. Immunity 15: 71-82. Polic, B., D. Kunkel, A. Scheffold, K. Rajewsky. 2001. How αβ T cells deal with induced TCR α ablation. Proc. Natl. Acad. Sci. USA 98: 8744-8749. Moses, C. T., K. M. Thorstenson, S. C. Jameson, A. Khoruts. 2003. Competition for self ligands restrains homeostatic proliferation of naive CD4 T cells. Proc. Natl. Acad. Sci. USA 100: 1185-1190. Viret, C., F. S. Wong, C. A. Janeway, Jr. 1999. Designing and maintaining the mature TCR repertoire: the continuum of self-peptide: self-MHC complex recognition. Immunity 10: 559-568. Witherden, D., N. van Oers, C. Waltzinger, A. Weiss, C. Benoist, D. Mathis. 2000. Tetracycline-controllable selection of CD4+ T cells: half-life and survival signals in the absence of major histocompatibility complex class II molecules. J. Exp. Med. 191: 355-364. Murphy, K. M., A. B. Heimberger, D. Y. Loh. 1990. Induction by antigen of intrathymic apoptosis of CD4+CD8+TCRlo thymocytes in vivo. Science 250: 720-1723. Duffy, D., C. P. Yang, A. Heath, P. Garside, E. B. Bell. 2006. Naive T-cell receptor transgenic T cells help memory B cells produce antibody. Immunology 119: 76-384. Haskins, K., R. Kubo, J. White, M. Pigeon, J. Kappler, P. Marrack. 1983. The major histocompatibility complex-restricted antigen receptor on T cells, I: isolation with a monoclonal antibody. J. Exp. Med. 157: 1149-1169. Pape, K. A., A. Khoruts, A. Mondino, M. K. Jenkins. 1997. Inflammatory cytokines enhance the in vivo clonal expansion and differentiation of antigen-activated CD4+ T cells. J. Immunol. 159: 591-598. Bates, J. T., R. P. Bucy. 2005. Enhanced responsiveness to antigen contributes more to immunological memory in CD4 T cells than increases in the number of cells. Immunology 116: 318-327. Degermann, S., E. Pria, L. Adorini. 1996. Soluble protein but not peptide administration diverts the immune response of a clonal CD4+ T cell population to the T helper 2 cell pathway. J. Immunol. 157: 3260-3269. Brewer, J. M., M. Conacher, C. A. Hunter, M. Mohrs, F. Brombacher, J. Alexander. 1999. Aluminium hydroxide adjuvant initiates strong antigen-specific Th2 responses in the absence of IL-4- or IL-13-mediated signaling. J. Immunol. 163: 6448-6454. London, C. A., V. L. Perez, A. K. Abbas. 1999. Functional characteristics and survival requirements of memory CD4+ T lymphocytes in vivo. J. Immunol. 162: 766-773. Merica, R., A. Khoruts, K. A. Pape, R. L. Reinhardt, M. K. Jenkins. 2000. Antigen-experienced CD4 T cells display a reduced capacity for clonal expansion in vivo that is imposed by factors present in the immune host. J. Immunol. 164: 4551-4557. Rolstad, B., S. Fossum, H. Bazin, I. Kimber, J. Marshall, S. M. Sparshott, W. L. Ford. 1985. The rapid rejection of allogeneic lymphocytes by a non-adaptive, cell-mediated mechanism (NK activity). Immunology 54: 127-138. Kasai, M., T. Yoneda, S. Habu, Y. Maruyama, K. Okumura, T. Tokunaga. 1981. In vivo effect of anti-asialo GM1 antibody on natural killer activity. Nature 291: 334-335. Murali-Krishna, K., R. Ahmed. 2000. Cutting edge: naive T cells masquerading as memory cells. J. Immunol. 165: 1733-1737. Purton, J. F., J. T. Tan, M. P. Rubinstein, D. M. Kim, J. Sprent, C. D. Surh. 2007. Antiviral CD4+ memory T cells are IL-15 dependent. J. Exp. Med. 204: 951-961. Grandjean, I., L. Duban, E. A. Bonney, E. Corcuff, J. P. Di Santo, P. Matzinger, O. Lantz. 2003. Are major histocompatibility complex molecules involved in the survival of naive CD4+ T cells?. J. Exp. Med. 198: 1089-1102. Jerne, N. K.. 1974. Towards a network theory of the immune system. Ann. Immunol. 125: 373-389. Bailey, D. W.. 1970. Four approaches to estimating number of histocompatibility loci. Transplant Proc. 2: 32-38. Wettstein, P. J., N. D. Borson. 2007. Distributions of single nucleotide polymorphisms in differential chromosome segments of congenic resistant strains that define minor histocompatibility antigens. Immunogenetics 59: 631-639. Mendoza, L. M., G. Villaflor, P. Eden, D. Roopenian, N. Shastri. 2001. Distinguishing self from nonself: immunogenicity of the murine H47 locus is determined by a single amino acid substitution in an unusual peptide. J. Immunol. 166: 4438-4445. Zuberi, A. R., G. J. Christianson, L. M. Mendoza, N. Shastri, D. C. Roopenian. 1998. Positional cloning and molecular characterization of an immunodominant cytotoxic determinant of the mouse H3 minor histocompatibility complex. Immunity 9: 687-698. Wiltshire, T., M. T. Pletcher, S. Batalov, S. W. Barnes, L. M. Tarantino, M. P. Cooke, H. Wu, K. Smylie, A. Santrosyan, N. G. Copeland, et al 2003. Genome-wide single-nucleotide polymorphism analysis defines haplotype patterns in mouse. Proc. Natl. Acad. Sci. USA 100: 3380-3385. Graber, J. H., G. A. Churchill, K. J. Dipetrillo, B. L. King, P. M. Petkov, K. Paigen. 2006. Patterns and mechanisms of genome organization in the mouse. J. Exp. Zoolog. A Comp. Exp. Biol. 305: 683-688. Kanagawa, O., G. Xu, A. Tevaarwerk, B. A. Vaupel. 2000. Protection of nonobese diabetic mice from diabetes by gene(s) closely linked to IFN-γ receptor loci. J. Immunol. 164: 3919-3923. Wolfer, D. P., W. E. Crusio, H. P. Lipp. 2002. Knockout mice: simple solutions to the problems of genetic background and flanking genes. Trends Neurosci. 25: 336-340. Ridgway, W. M., B. Healy, L. J. Smink, D. Rainbow, L. S. Wicker. 2007. New tools for defining the “genetic background” of inbred mouse strains. Nat. Immunol. 8: 669-673.